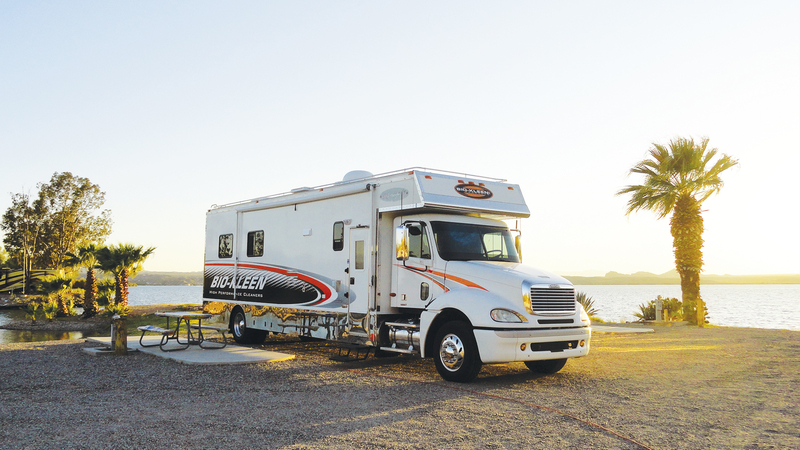 Tim and TracyLynn Kowalski spend 300 nights per year on the road, promoting their family of BioKleen products. Tim and TracyLynn Kowalski met on a beach in Clearwater, Fla., in 1982 and enjoyed three amazing days together. They didn’t see each other until 25 years later, when she was one of the decision makers for an RV accessories distributor, Stag-Parkway He was pitching his Bio-Kleen environmentally friendly cleaning products for RVs and, apparently, Tim did a good job because Stag-Parkway took on the products. 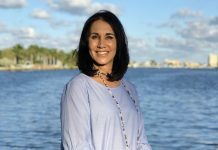 TracyLynn was a savvy businesswoman and she stayed at Stag-Parkway for a couple more years, keeping an eye on this growing Bio-Kleen company. She approached Tim and asked if he needed a salesperson to help grow the RV side of the business. He said yes, and TracyLynn joined the company. Tim had the expertise on the boat side and she had all the contacts in the RV world. 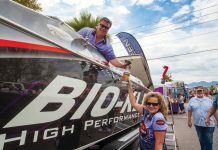 The Bio-Kleen boat is a 35’ Cigarette Café Racer powered by twin Sterling Performance engines. 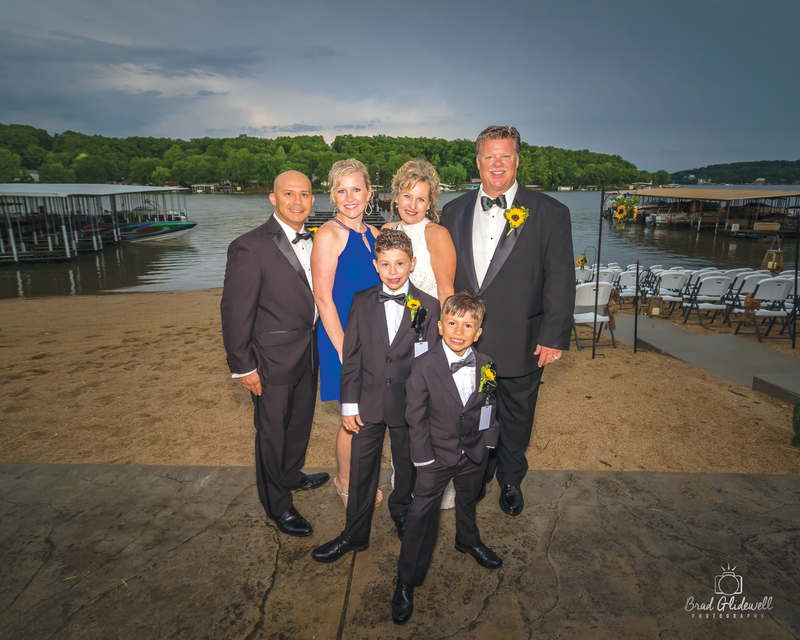 Since Tim’s a little on the shy side, it took a while before he mustered up the courage to ask TracyLynn if she was the same girl that he had met on that beach a quarter of a century earlier. She confirmed that she was and the two have been together ever since, first as co-workers then as a couple. 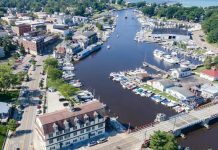 They call Kalamazoo, Mich., home, but they are rarely there, spending about 300 nights each year on the road, attending RV or boat shows or poker runs or similar events, all in the name of promoting the Bio-Kleen name. Tim, 55, has been a part of the Lake of the Ozarks Shootout for about as long as he has known TracyLynn (she prefers to keep her age to herself), so last year they were married at Captain Ron’s Bar & Grill at Lake of the Ozarks by Jeff Dorhauer, who has been instrumental in the shootout since its inception. Tim is actually business partners with the Duggan family in the Skallywag’s RV Park, which is also in Lake of the Ozarks. The name for the park came from a nickname Tim used for his two grandsons. He would wrestle with them and call them Skallywags. 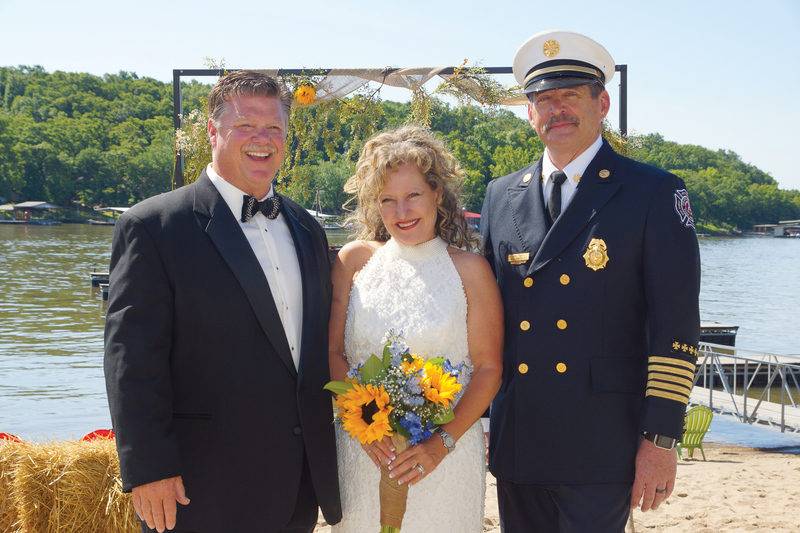 Tim and TracyLynn on their wedding day with Capt. 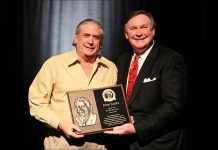 Jeff Dorhauer, who is one of the most involved volunteers at the Lake of the Ozarks Shootout. Tim estimates that of the miles logged on the road each year, 15,000 of those are with his 1993 Cigarette 35’ Café Racer in tow behind his Renegade Toterhome. He started out towing the 14,000-pound boat behind a Chevrolet Suburban. He then moved up to a Ford F650 Toterhome, but it still wasn’t heavy-duty enough, so Tim bought the Renegade that is powered by a 430-hp Caterpillar diesel with a 12-speed smart-shift transmission. A veteran boater, Tim bought the Café Racer about 14 years ago. 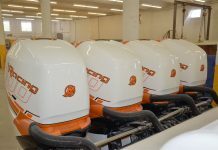 It’s powered by twin 572-cid Sterling Performance engines with IMCO SCX drives. It ran 82 mph in the mile-long LOTO Shootout and 80 mph last year in the ¾-mile run last year. No matter the event, Tim always makes sure he participates in the rides for kids and families that are supported by the local charity. 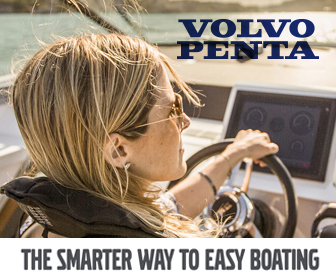 “I wanted a boat with a name that had some nostalgia to it,” Tim explained. 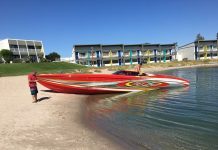 “I knew if I had a Cigarette with Bio-Kleen on it, even if it was an older boat, people would still say, it’s a Cigarette.” He had Dean Loucks at The Art of Design paint the boat and the Bio-Kleen name glows in the dark. 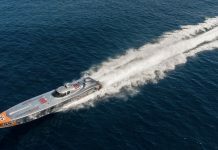 While he runs the shootout every year, Tim isn’t that concerned about the speed of the boat. That’s not why he bought it. “Taking the kids for rides, the smiles that we can put on their faces,” he said. “The only way I see to be successful is to give back.” Regardless of the event that Tim attends, he always arrives early so he can participate in the rides for underprivileged or special-needs children that take place at events around the country. For example, when we spoke to Tim and TracyLynn in March, they were preparing to head to the Desert Storm Poker Run in Lake Havasu City, Ariz., the weekend of April 21. This year is Tim’s 11th at Desert Storm and he made sure he was there in time to take kids for rides on April 18. When he was a kid growing up in Paw Paw, Mich., Tim boated on Lake Michigan. His father was a machinist and mom stayed home taking care of Tim and his two sisters. Tim started on the water with a 13’ Clipper Craft powered by a 40-hp Johnson outboard. “I could take it over to South Haven when it was flat water,” said Tim. He was also introduced to the RV lifestyle when the family took vacations to such popular attractions as Disney World, Cedar Point in Ohio and other amusement parks in their RV, staying at campgrounds. “I really enjoyed that part of the lifestyle,” Tim said. If they’re not at a marina, Tim and TracyLynn can most likely be found at a local campground with their Bio-Kleen RV. He developed his knack for chemicals and how to mix them effectively at the hands of a family friend who was a chemical engineer. Tim went on to major in chemical engineering at the University of Michigan in Ann Arbor. In addition to studying and enjoying college life, Tim developed his first cleaning product for a local company, Stryker Instruments, which made surgical equipment and supplies. It was called Stryk-It Cleaner and Tim explained, “We washed a bunch of surgical parts and the handheld saws as well as the blades themselves.” The company also used the product for clean rooms. 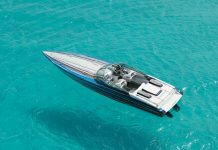 While he was in school, Tim continued boating with an 18’ Baretta open-bow and after he graduated, he moved up to a 24’ Sea Ray weekender that he basically lived in during the summer, trailering it all over southwestern Michigan. 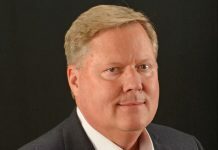 Fresh out of school, he started Bio-Kleen in August of 1987. “I started the industrial side of things and had all kinds of industrial products and started working with some detail shops,” Tim recalled. The Bio-Kleen family of products has been designed to clean without being harmful to the environment. 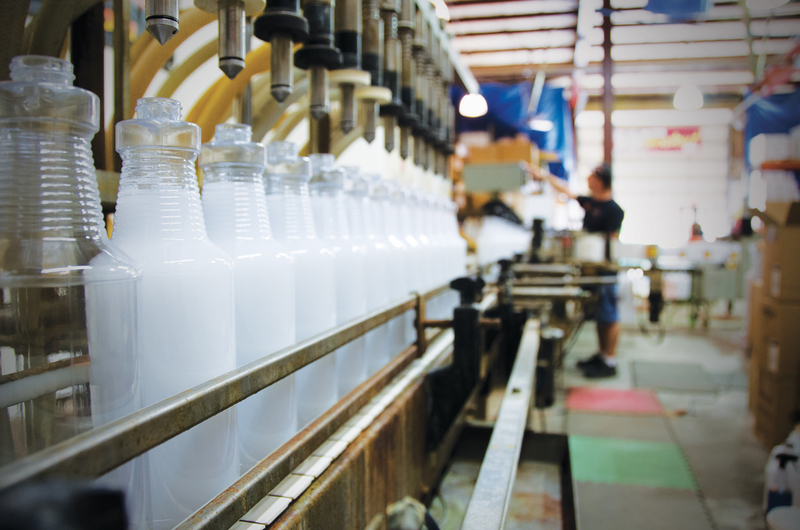 The key ingredient to Bio-Kleen products is a polymer that Tim has perfected. “I’m finding that these polymers have a broader shoulder to them, they last longer, and have longer retention,” he said. He said the company’s most popular marine products are Amazing Armor and Amazing Cleaner. “It deep cleans, protects with a 70 SPFand the protectant has a coconut lime fragrance that makes you feel like you’re in the tropics when you’re using it,” Tim added. 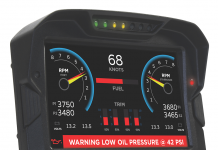 Bio-Kleen also has the RV line that TracyLynn has helped make popular, plus products for the automotive, snowmobile, motorcycle, household and janitorial markets. Regardless of the product they are promoting, Tim and TracyLynn will be on the road this year attending 37 events across the country. 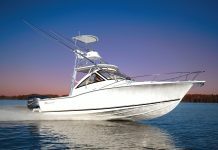 In the boating community, the schedule includes poker runs and races in addition to Marine and RV distributor shows. 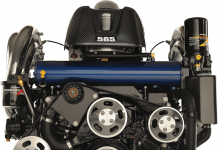 Tim got into the performance-boat scene with a 1994 28’ Velocity powered by a Mercury Hi-Performance HP465. 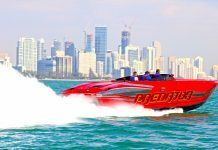 After replacing that boat with a 1997 version, he met the late Keith Holmes, who ran the 40’ Skater, Cat Can Do, in the Unlimited and Superboat classes in offshore racing. With all of his time taken up going to offshore races, Tim decided to sell the Velocity. With Bio-Kleen sponsoring the boat, the team captured numerous checkered flags and won awards such as Super Cat Team of the Year. 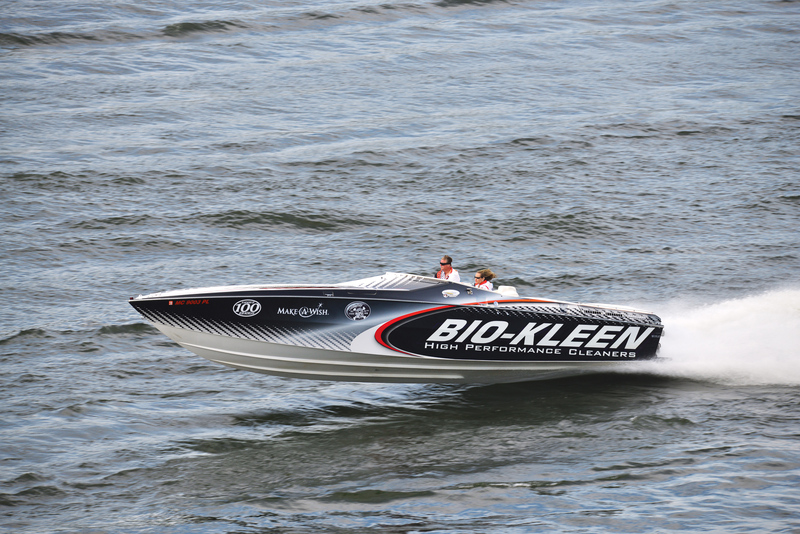 Bio-Kleen also became the official marine cleaner of the American Power Boat Association. 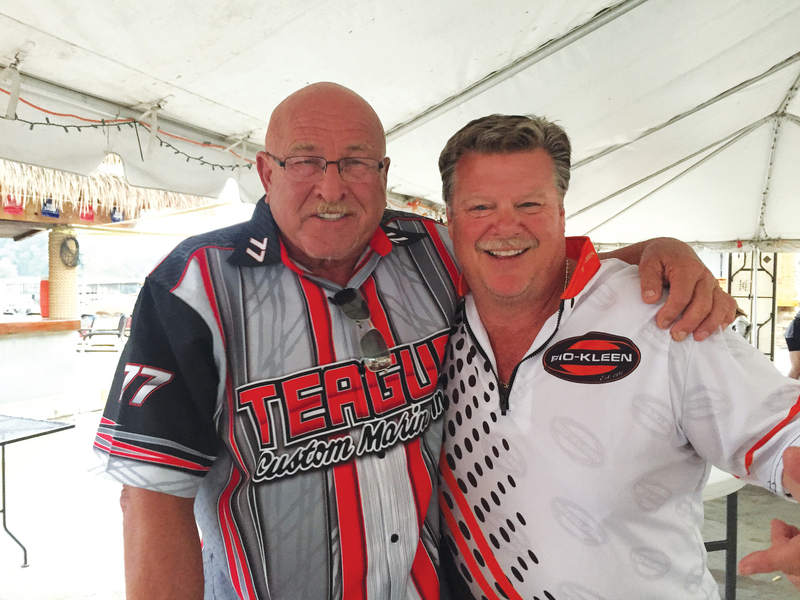 Additionally, Tim met and befriended many race-team owners including Bob Teague, president of Teague Custom Marine in Valencia, Calif., and the throttleman for his 36’ Skater, Team Teague Custom Marine Offshore Racing #77. Bob Teague (L) and Tim are more than friends, they are also business partners. 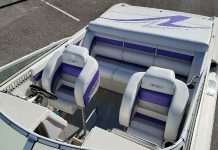 At the time, Teague Custom Marine was selling Bio-Kleen and a few competitive products. “I asked him a few years ago, ‘What do you like about those products and what do you like about my product and if I could tie all of them together, if I came up with a solution would he test it for me,’” Tim explained. One year at the Desert Storm Poker Run, Tim handed Teague a bottle of cleaner with a label he had made that read, Teague Shine. At a driver’s meeting for the charity rides, Teague held up the bottle and said, “Here it is folks, coming soon to your store shelves, Teague Shine.” The partnership between the two companies continues to this day. While he was sponsoring the Cat Can Do team, Tim stayed involved in the poker-run world, too, sponsoring a friend’s Sonic 386 in exchange for putting the Bio-Kleen name on the side until he bought the 35’ Café Racer. 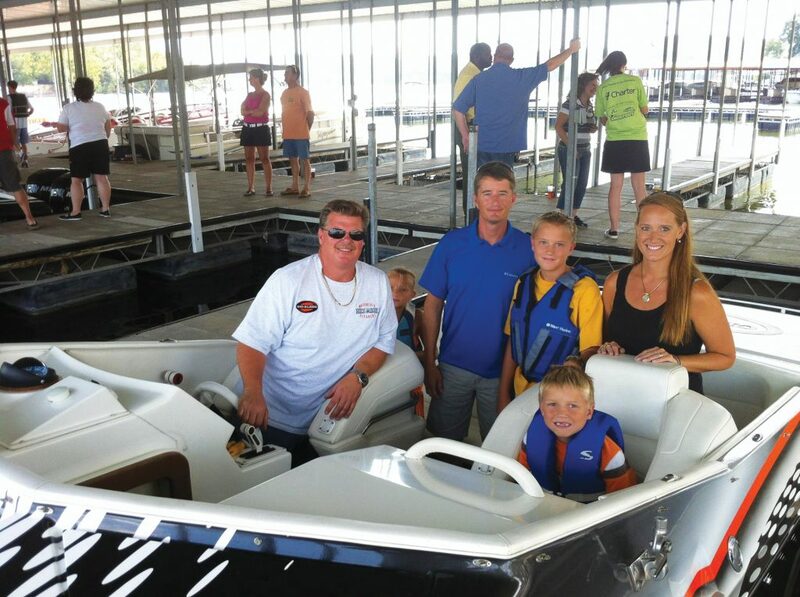 He and TracyLynn are part of the Western Michigan Offshore Powerboat club and they enjoy fun runs and other events with the Northern Illinois Offshore Club. 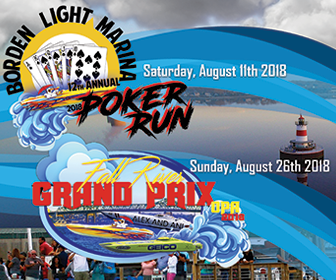 The Boyne Thunder Poker Run is a favorite event and this year, they hope to participate in the Texas Outlaw Challenge. Tim and TracyLynn think it’s awesome how all these events raise money for so many different charities.